Joliet Illinois. (September 19, 2015) - Making his first-career start at Chicagoland Speedway in Joliet, Ill., Hayley got off to a fast pace during the lone NASCAR Camping World Truck Series (NCWTS) practice Friday morning, posting the seventh-fastest time. However, heavy rain moved into the area, washing out qualifying and postponing the American Ethanol 225 until Saturday morning. When racing resumed Saturday, Hayley would start the 150-lap race from the seventh position, per the NCWTS rule book. The Sunoco Rookie of the Year contender quickly settled into the top-10 with his No. 13 Carolina Nut Co. Toyota Tundra. Within the initial laps, Hayley reported that his ThorSport Racing machine was "a little free, but beginning to come to him." Holding on until the competition caution waved on lap 30, crew chief Jeff Hensley brought the Canada native down pit road for four tires, fuel and an air pressure adjustment to aid in his handling issues. When the race resumed on lap 37, Hayley restarted in the 12th position but was back into the top-10 by lap 41. The 19-year-old driver hit pit road under the next caution, on lap 83, for four tires and fuel. Looking to make it the last 67 laps of the race on one tank of gas, Hayley came up five laps short of the finish. Forced to pit for a splash of gas on lap 145, Hayley was relinquished to a 16th-place finishing spot, four laps down to race winner, John Hunter Nemechek. "The No. 13 Carolina Nut Co. Toyota Tundra was pretty good throughout the morning at Chicago. We ran inside the top-10 and should've finished there honestly. Unfortunately, our strategy didn't work out the way we hoped at the end, and it hurt our overall result. Either way, I'm looking forward to getting back to a short-track next weekend at New Hampshire Motor Speedway and hopefully we can put forth a strong run." Cameron Hayley finished 16th in his debut at Chicagoland Speedway. Hayley finished Friday's lone practice session seventh on the speed charts. The No. 13 Carolina Nut Co. Toyota Tundra started seventh after qualifying was rained out. The ThorSport Racing driver is currently sixth in the 2015 NCWTS driver point standings just two points behind Daniel Hemric in 5th. John Hunter Nemechek won American Ethanol 225 at Chicagoland Speedway, followed by Tyler Reddick (2nd), Timothy Peters (3rd), Daniel Suarez (4th) and Johnny Sauter (5th). ThorSport teammate Matt Crafton finished 14th and Jesse Little 30th. ThorSport Racing, based in a state-of-the-art 100,000-square-foot facility in Sandusky, Ohio, is the longest-tenured NASCAR Camping World Truck Series team. ThorSport, which has competed in the NCWTS since 1996, will run the No. 88 Menards Toyota Tundra driven by two-time NCWTS drivers' champion Matt Crafton, the No. 98 Nextant Aerospace/Smokey Mountain Herbal Snuff/Curb Records Toyota Tundra driven by Johnny Sauter, and the No. 13 Cabinets by Hayley Toyota Tundra driven by Sunoco Rookie of the Year contender, Cameron Hayley in 2015. CAMERON HAYLEY READY TO BLOW AWAY THE COMPETITION IN THE "WINDY CITY"
Sandusky, Ohio (September 14, 2015) - Coming off his eighth top-10 finish of the 2015 NASCAR Camping World Truck Series (NCWTS) season in his home country of Canada, Sunoco Rookie of the Year contender Cameron Hayley is ready to keep his success alive when he heads to Chicagoland Speedway in Joliet, Ill. for the first time in his young career, for the American Ethanol 225, Friday night. Making his 13th different track debut of 2015 this weekend, the ThorSport Racing driver recently had the opportunity to partake in a rookie test at the 1.5-mile D-shaped tri-oval in the "Windy City." Pairing his previous knowledge of mile-and-a-half tracks and his recent time at Chicagoland Speedway, Hayley hopes to pilot his No. 13 Carolina Nut Co. Toyota Tundra to the front of the pack in the 7th annual event. Sitting sixth in the NCWTS driver point standings, and third overall in the Sunoco Rookie of the Year battle, the 19-year-old driver has led the ultra-competitive NCWTS field for a total of 54 laps, including 13 laps during the series' last stop on the circuit at Canadian Tire Motorsport Park in Bowmanville, Ontario. Hayley hopes to lead the lap that matters most, the last one, at the end of Friday night's 150-lap event. "I've never raced at Chicagoland Speedway before in my career, but thankfully I was able to be apart of the rookie test last week. It's definitely a very worn out race track. I can tell that it's going to be completely opposite of Michigan, where you have all the grip in the world. Chicagoland is going to be more about forward drive off the corners. Even with the rookie test, I still have a little bit of learning left to do this weekend, but hopefully we can get up to speed quickly." 2015 Chassis Chatter... The No. 13 ThorSport Racing team will utilize chassis No. 53 for Friday night's American Ethanol 225 at Chicagoland Speedway. This particular chassis was last seen earlier in 2015 at Kentucky Speedway in Sparta, finishing 9th, and Pocono (Pa.) Raceway, where Hayley finished a career-best fourth. Windy City Stats... Hayley will make his 13th NCWTS track debut of 2015 at Chicagoland Speedway on Friday night. Before 2015, Hayley had experience on three NCWTS tracks on the 2015 schedule; Canadian Tire Motorsports Park, Texas Motor Speedway and New Hampshire Motor Speedway. Season Review... After 15 races this season, Hayley has completed 2135 of 2255 laps attempted (94.6%) and led 54 laps en route to three top-five and eight top-10 finishes. Rookie Race... Hayley is currently third in the 2015 Sunoco Rookie of the Year battle, a mere eight points behind second-place Daniel Hemric. Both rookie contenders are chasing leader, Erik Jones, after 15 races this season. Previous Race Recap... Returning to his home country for the second time in his NCWTS career, Hayley qualified seventh for the NCWTS 250 at Canadian Tire Motorsport Park. With various pit strategies playing out, the 19-year-old driver led 13 laps early on in the 64-lap event, and eventually was relegated to a seventh-place finish, his eighth top-10 finish of the season. Bowmanville, Ontario (August 31, 2015) - Making his second-career start in his native Canada, Cameron Hayley, driver of the No. 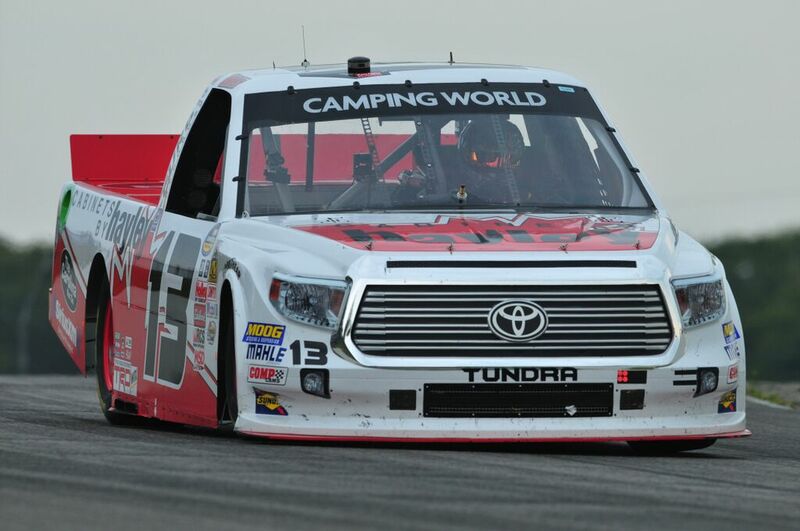 13 Cabinets by Hayley Toyota Tundra, led laps, and looked strong in Sunday's NASCAR Camping World Truck Series (NCWTS) 250 at the 2.459-mile Canadian Tire Motorsport Park (CTMP) in Bowmanville, Ontario. The 2015 Sunoco Rookie of the Year contender started a track-best seventh, led 13 laps, and finished a track-best seventh in the 64-lap event. Following the drop of the green flag, Hayley settled into the seventh position, and into a nice rhythm. With teams on different pit strategies, Hayley would work his way into the fourth position by lap 8, as teams started making green flag pit stops. Hayley would continue his climb up the leader board, taking over the race lead at lap 13, just before the first caution flag of the afternoon was displayed on lap 15, for a stopped truck. Staying with their strategy, crew chief Jeff Hensley told Hayley to save fuel, and the 19-year-old driver would lead the field back to the green flag, for only the fourth time in his young career, at lap 16. Hayley would pace the field for 13 circuits before giving up the lead to come to pit road at lap 28, under green. During the stop, the Cabinets by Hayley team changed four tires, added fuel, and made a slight air pressure adjustment. Hayley would return to the track in the 20th position. The ThorSport Racing driver would continue to run top-five lap times, and work his way back into the fifth position when the third caution flag of the afternoon was displayed on lap 45 for an accident in Turn 2. During the stop, Hensley brought his young rookie driver down pit road for one final stop - topping off the No. 13 Toyota Tundra with fuel, and making one final adjustment. Hayley would restart 15th with less than 20 laps remaining. Continuing to run top-five lap times, Hayley was able to muscle his way through traffic, and survive a green-white-checkered flag finish, to bring home his first top-10 finish in two starts north of the border. "We had great Cabinets by Hayley Toyota Tundra this weekend. We got a little tight towards the end of the race, and could never really gain much momentum on the leaders. It was great leading laps in front of my hometown crowd. I love racing in Canada, and the support I had all weekend from the great fans up here was fantastic." Cabinets by Hayley is the premier manufacturer of metal garage and storage cabinets in Canada, coast to coast. Formed in 1978, Hayley Industrial Electronics Ltd. produced high-powered, uninterruptible power supply units for heavy-duty applications. After nearly 30 years of high-standard systems in the industrial field, Hayley formed Cabinets by Hayley to service the residential market. Now, Cabinets by Hayley offers a full line of metal storage cabinets for the people that want the best in quality and appearance for their storage needs. To learn more, visit www.CabnetsByHayley.com. Sandusky, Ohio (August 25, 2015) - Coming off a tough night in the hills of Tennessee, at Bristol (Tenn.) Motor Speedway (BMS) last week, NASCAR Camping World Truck Series (NCWTS) Sunoco Rookie of the Year contender, Cameron Hayley, is ready to set his sights on familiar territory - his native Canada, and road course racing at Canadian Tire Motorsports Park (CTMP) in Bowmanville, Ontario, Canada, site of Sunday's NCWTS 250. Making his NCWTS debut on the 10-turn, 2.459-mile road course in 2014, Hayley qualified 10th and finished 11th, following the 67-lap event. Since making his debut, north of the border, one year ago, the Calgary, Alberta, Canada native has made 17 starts in NASCAR's third-tier division, amassing three top-five and nine top-10 finishes. In fact, in his first full-time season in 2015, Hayley is currently sixth in the NCWTS driver point standings, and third in the Sunoco Rookie of the Year standings with only nine races remaining on the 23-race NCWTS schedule. As one of only three tracks on the 2015 NCWTS schedule that the ThorSport Racing driver has experience at, Hayley is looking to capitalize on last year's run at CTMP, and his NCWTS experience to date, to capture his first series win in front of his hometown crowd on Sunday. "Not only is this a track I've been to before, it's also in my home country. I just hope that I will have a good run for all of my Canadian fans. We've done really well at tracks that I've been to in the past this year, already. I've been to Sonoma a couple times and that place was really difficult. You look at Canadian Tire Motorsport Park and think, 'it can't be as difficult as Sonoma,' but it's a very fast race track, and fast race tracks are not forgiving. It takes a lot of finesse and a lot of guts to go out there and get it done. We are bringing a really good truck, so I think this will be another good race for us to go out and get a solid top-five, if not a win." * 2015 Chassis Chatter... The No. 13 ThorSport Racing team will utilize chassis No. 23 for Sunday's NCWTS 250 at Canadian Tire Motorsport Park. This particular chassis has run numerous races as a part of the No. 13 team's fleet, but has recently been converted into a road course racing specific chassis for this weekend's NCWTS 25O. * Canada Stats... Hayley will return toCTMP for the second time in his young NCWTS career on Sunday. The Cabinets by Hayley driver, who made his debut at the 10-turn road course in 2014, started 10th and finished 11th. CTMP is one of only three tracks on the 2015 NCWTS schedule that the rookie has experience on. * 2015 Season in Review... After 14 races this season, Hayley has completed 2071 of 2191 laps attempted (94.5%), and led 41 laps en route to three top-five and seven top-10 finishes. Hayley's season-best start is third at Atlanta (Ga.) Motor Speedway, and Martinsville (Va.) Speedway, and his season-best finish is fourth at Pocono (Pa.) Raceway. The ThorSport Racing driver has an Average Start of 8.7 and and Average Finish of 12.0. * Rookie Race... Hayley is currently third in the 2015 Sunoco Rookie of the Year battle behind leader, a mere five points behind second-place, Daniel Hemric. Both drivers trail leader, Erik Jones. * Previous Race Recap... Heading to "Thunder Valley" for the first time in his NCWTS career, Hayley qualified ninth, was involved in an early accident, and finished 18th in the UNOH 200 at Bristol (Tenn.) Motor Speedway. Bristol, Tenn. (August 20, 2015) - Heading to Bristol (Tenn.) Motor Speedway (BMS) for his 12th different NASCAR Camping World Truck Series (NCWTS) track debut, Sunoco Rookie of the Year candidate, Cameron Hayley, adapted quickly to the high banks of the 0.533-mile concrete oval. Posting the seventh and eighth fastest times, respectively, in both practice sessions at BMS, Hayley kept his success going, by qualifying ninth for Wednesday night's UNOH 200. With weather threatening BMS throughout the day Wednesday, intensity was high from the drop of the green flag. Racing alongside the No. 51 of Daniel Suarez on lap 33, the two drivers got together, bringing out the first caution of the night. However, able to keep it off the wall, the 19-year-old driver suffered minimal damage on his No. 13 Carolina Nut Co. Toyota Tundra, but was relinquished one lap down to the leaders. Going a second lap down under a long green flag run, Hayley caught a break when the caution flag waved on lap 81. Crew chief, Jeff Hensley, made the call for the Sunoco Rookie of the Year contender to stay on the track and take the "wave around" to get one of his two laps back. Just 14 laps later, the caution flag flew again, allowing Hayley to be the beneficiary of getting his lap back. Back on the lead lap, Hensley made the call to bring the ThorSport Racing driver down pit road for four tires, fuel and an adjustment to aid in an "extremely tight" Toyota Tundra. Running lap times comparable to the leaders, and trying to make up ground as quickly as possible, the Canadian-native had to use evasive action to try to avoid the No. 23 of Spencer Gallagher spinning directly in front of him. Unfortunately, Hayley clipped the nose of his Toyota Tundra as he drove by. Just as Hensley called the No. 13 down pit road for repairs, a rainstorm hit the track allowing Hayley to maintain his position. After a short 45 minutes of track drying, Hayley climbed back into his Carolina Nut Co. Toyota Tundra, and brought it to the attention of his ThorSport Racing team who had a plan formulated to fix the nose of his No. 13 machine for the remaining 24 laps of the 200-lap event. Eventually going a lap down to the leaders, due to extensive damage, Hayley crossed the finish line in the 18th position behind UNOH 200 race winner, Ryan Blaney. "It was a tough night for our Carolina Nut Co. team. That spin at the beginning of the race got us behind early on, but we were able to battle back from two laps down. At one point we were running lap times as fast as the leaders. Unfortunately, we were right behind Spencer Gallagher when he spun. I tried to duck low to avoid him, but clipped his nose. The guys worked hard to fix it up as best as they could so we could finish the race. All-in-all, it was a long day, but it's Bristol, it happens. I'm already looking ahead and can't wait to head to my hometown track next week."